India is a young country. And I don't mean that in the context of 70 years of independence. I mean that in age. One in two Indians are still eighteen or under, yet to start earning and join the expanding throng of Indian motorcyclists. Pure economic reality is that they'll start with cheap, affordable motorcycles. In time, the Rs 5-7 lakh motorcycle space, odds are, is where they'll make their first big bike purchase. These motorcycles displace 650cc or thereabouts. 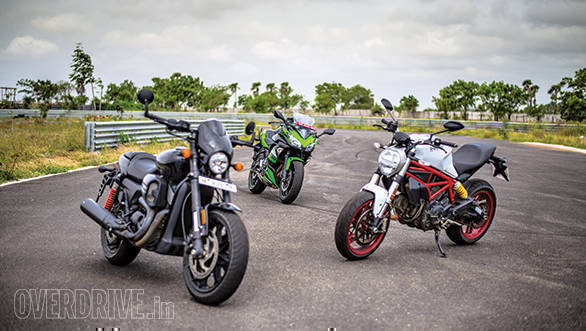 The three new additions here are the Harley-Davidson Street Rod, the brand-new Kawasaki Ninja 650 and, at a solid premium, the Ducati Monster 797. 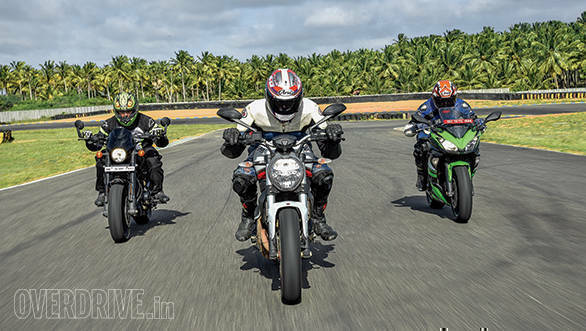 Rishabh and Akshay, relatively new riders, Anand Dharmaraj, expert rider and tester, and I rode the motorcycles in Mumbai, Bangalore city traffic, out on the highway for 3,500km and on the racetrack to see what they do. And I promise you, the results are both surprising and bode well for the motorcycle enthusiasts. 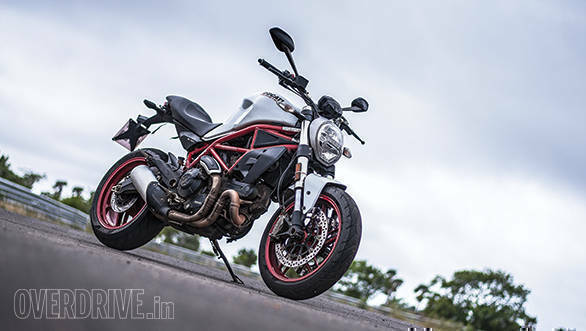 The Ducati Monster 821 represented the creation of a strange gap in Ducati's sporty naked motorcycle line-up. The 821 was priced high. The official line was that the Scrambler range was to be the new cornerstone of Ducati's most affordable motorcycles. The 796 and 795 Monsters disappeared. Ducati seems to have changed tack now and the new 797 is the entry-level Monster. It uses a trellis frame, basic suspension, the engine and gearbox from the Scrambler, and the iconic Monster styling to create a dramatic entry-level motorcycle. Keeping the pricing intent clearly in focus, standard ABS is the only electronic system it gets. It will surprise you, I promise. Ducati has put in a lot of effort to ensure the motorcycle is friendly and easy to ride. Visual evidence includes a clutch lever that's as long as my forearm. You won't spot it until you begin to wonder how the clutch effort is as light as the average 100cc commuter motorcycle. And of course, there is a slip-assist clutch which reduces lever effort. Similarly, the 73PS 803cc L-twin is a lot smoother even at low revs than you expect. The throttle response is swift but not jumpy like the Scrambler which is a huge relief. The seat height is low and the Monster, in general, is remarkably easy to ride. Short riders will like how compact, manageable and easy to ride the Monster is. Getting around the city feels natural and uneventful in terms of discomfort. There is some heat from the engine, of course. You shouldn't notice most of it if you're geared up properly. But if you're the shorts and flip-flops type, I'd say you've a lot more to worry about than engine heat. It's still unabashedly sporty. 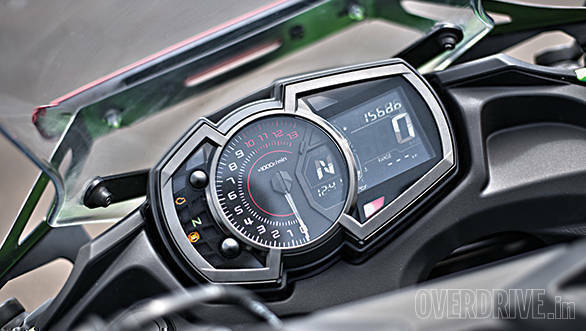 Response to your steering inputs is immediate but Ducati has managed to make this effortless which means new riders will not think of the 797 as too reactive or too agile. Nicely done. That means you can get through traffic very fast if you want to and you will be beaming too. When you head out on the highway, the Monster reveals two issues immediately. First, the lack of any rear bodywork and the design of the integrated grab rails means mounting luggage is tough. I had to run nylon webbing loops (I'm a hyper-prepared, OCD type) through the subframe to make the bungee points I finally used. Second, there is no wind protection, which means sustained 120-130kmph over a whole day will produce some neck strain. The wee instrument cluster does help but a lot of highway miles, if that's your thing, requires a small screen of some sort. Hint: google the Monster 797 Plus. But my god, this is a good highway machine. Substantial torque arrives at 3,000rpm and it stays to the redline. It's easy to find a calm, swift highway lope at any speed you choose between a sedate 80kmph to a strident (and illegal) 150kmph if you like. 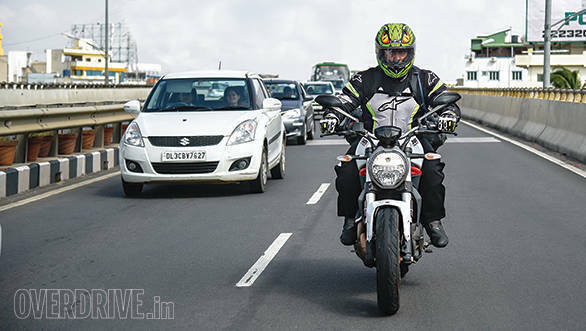 Ridden at an average speed hovering around 90kmph, the Ducati surprised me by always being the last motorcycle in this group to switch on its low fuel light. Some of that is the reasonable economy and partly the slightly larger fuel tank. But I'm surprised that there isn't a fuel gauge on this motorcycle. It made me do extra highway maths and I'd rather not have. You don't really notice it on the shorter city rides - the Monster feels tautly damped and sporty - but out on the highway you will find the ride quality to be well-controlled. It isn't plush or soft but the Ducati is able to de-sting all but the biggest of bumps. I was surprised at how thoughtfully the suspension is tuned. You do get rear pre-load and rebound adjustment. Similarly, the handling is sporty and you really will enjoy twisty sections. I don't think there's a single Ducati, Diavel included, that doesn't open your eyes at a racetrack. When you really pick up the pace on the 797, it refuses to lose its grip on the composure and capability it's shown in the city traffic and out on the highway. The brakes (Brembo M4.32!) are strong and the initial bite is well-judged. At track pace, the Diablo Rosso IIs offer feedback-rich, trustworthy grip and you can really go hammer and tongs. Turn in is swift but not frantic. It's confident and sweet at big leans and unlike the Scrambler, the throttle isn't hypersensitive so it's easy to find a smooth groove at elevated speed. It's very easy to go very fast on the 797. I liked this a lot. Most importantly, while the 796 and the 795 felt too large for short, technical tracks like the Kari Motor Speedway, the 797 feels natural. It was the biggest worry I had when we started out on this story having read Rishabh's report from Thailand. The Ducati Monster 797 is noticeably more expensive than the other bikes here but that's a discussion for later. But as Anand put it, "If you like the nature and temperament of the KTM 390 Duke, the 797 will be a great upgrade." I agree and will add that the compact Ducati has a far wider appeal than the frantic nature of the 390 permits. Ducati engineers have judged the balance between capability and user-friendly personality rather well. The Ducati handily sliced through urbana, blitzed the highway and then delivered a whole bunch of rapid-fire laps at the racetrack too. That is very impressive! The Harley-Davidson Street Rod is thought-provoking. It breaks a handful of cruiser and H-D conventions with its design, ergonomics and intent. This combines startlingly well with the enjoyable, more powerful RevolutionX 750cc V-twin. The design raises ride height and mounts the pegs higher to release cornering clearance, while the sportier rake of the front end and leverage from the flat bar makes the Street Rod more responsive and connected. So how do 3,500km on it feel like? Well this is nice, I thought to myself in the initial miles on the Street Rod. It is compact like the Street 750 and that means dealing with city-chaos is a cinch. But the new design helps it stand out, so you feel free and happy rather than like god. 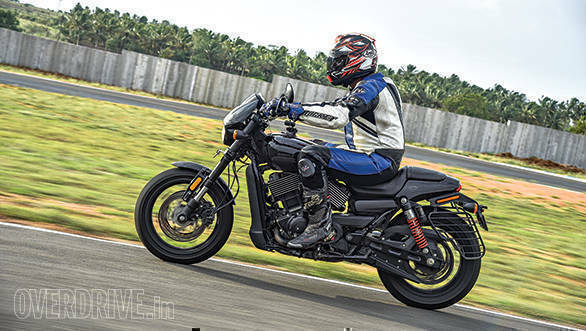 On the other hand, the twin front discs with ABS and the higher ground clearance fix both of the big issues with the Street 750. It does have a new problem. That would be immense engine heat. The engine has the front cylinder offset slightly to the right and the rear slightly to the left of the centre line. On the right, the air cleaner levers your leg out a few millimetres. On the left, there's no such hard point to rest your knee against. That means in slow traffic, the heat oozing from the rear cylinder dons its chef's hat and cooks your left thigh. The heat is unrelenting and you'll be squirming about at the lights. That aside, the Harley is super sweet. The torque is consistent as well as abundant, and progress is rapid even with the revs low and the gears high. It isn't torquey like the bigger air-cooled Harley engines, though. The Street Rod revs out to 9,000rpm and it likes to have 3,500rpm or more for smooth, thunder-y, torque to assert itself. The ride is more absorbent than you expect and handling is responsive. And decking stuff out is hard work. 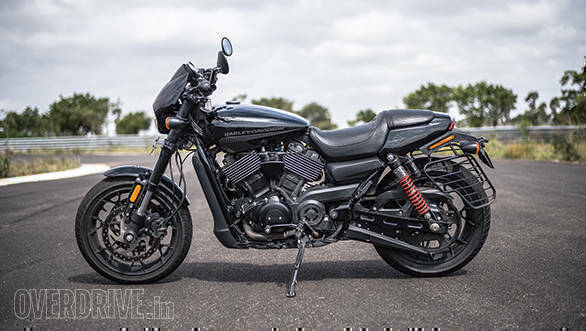 Indeed, engine heat issue apart, the Street Rod, to me, is one of the best city Harleys I've tested with its lighter weight, compact feel, good ride quality and great torque. The same qualities also make highway runs pleasurable. Bump absorption is always better than you expect and the handling is clean, direct and friendly too. But like the Ducati, the Harley also has no luggage mounting points unless you retain the dual-sided saree guard. And like the Ducati, it also suffers from windblast at sustained high speeds. But sit at 3,500rpm or thereabouts in top gear and you just know it feels right. It isn't perfect - the Harley has a low frequency up and down bob as the suspension handles the roads that never stops. This gets mildly annoying after 6-7 hours. The seat could also have been better. The mirrors do vibrate so your buddies are usually streaky blurs behind you. 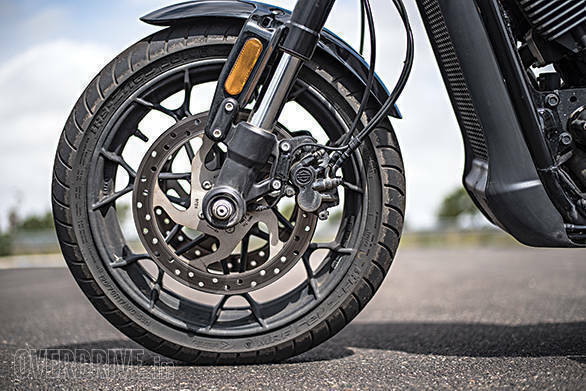 Minor niggles aside, the Harley is a happy, confident highway machine with great torque to rapidly pass any traffic, produce high average speeds easily and generally feel like it was designed to thrive in our conditions. A Harley? At the track? Yes! The Street Rod doesn't roll over and play dead at Turn 1. You do need to get over a few hiccups. The foot pegs are below the knees but placed dramatically high. So if you've just climbed off any other bike, the Street Rod feels like it places your knees next to your ears. The feeling passes, but it makes the jumping on and off at the racetrack harder work. The MRF tyres on the Street Rod must come in for applause. They were terrific right through this test but their performance was invaluable at the track. The 'Rod does have more ground clearance than normal, but the engine and frame have such capacity that you will eventually grind the pegs down hard. Hanging off and leaning into corners will allow some more speed but ultimately, you will be scraping the pegs in almost every corner. By this time you're going extremely quickly around the racetrack and I passed more than a few people on the Harley! The MRFs handled the pace as well as the additional stress of a peg being dug hard into tarmac without so much as a hint of protest. In word, the 'Rod is unexpectedly good fun at the track! 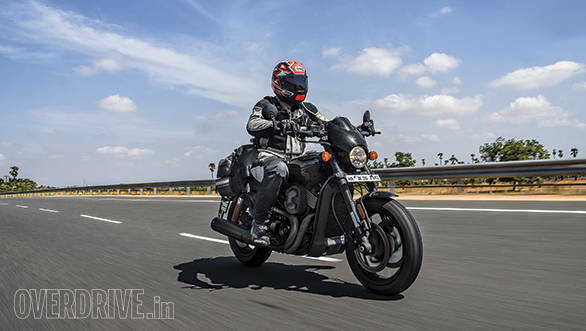 The Harley-Davidson Street Rod is quite the package and it surprised each one of us. We all knew some parts of the story - the unexpectedly good suspension and the extraordinary amount of heat, for instance. But the pace at the racetrack and the sheer enthusiasm for cornering was a huge, welcome surprise. Many of the "You got a Harley to the racetrack?" became "I got smoked by a Harley!" That's a proper enthusiasts' bike in our books. The previous Kawasaki Ninja 650 was a terrific all-rounder, albeit a bit rough around the edges. This new one makes a bit less power but the new frame is lighter, the suspension is better tuned, it has ABS and a sharper new fairing. While the previous 650 roamed a scanty field of options, this one has to run the gauntlet against a growing field of very good motorcycles. But the Ninja instills confidence in its abilities quickly. In temperament and nature, it's the calmest of this trio. The 650cc engine feels barely awake at city speeds and it is the smoothest engine in this test by a small margin too. And it must be said, both of the other engines sound louder and more personable than the mild-mannered Kawasaki parallel twin. Once you adjust to the fairing - it is a substantial fairing - the Ninja 650 does well in the city. It gathers more attention than the other bikes if that is your thing, but it gets through all of the same gaps that the other bikes do. It also shows a more comfortable and softer ride quality than the other two. But the big reason to buy the Ninja is a total and utter lack of engine heat on your legs in slow traffic or when stopped at a traffic light. In essence, the Z650 might feel a bit easier to commute on, but if you chose this motorcycle to ride to work every day, I would not be surprised at all. Nor would you be disappointed. 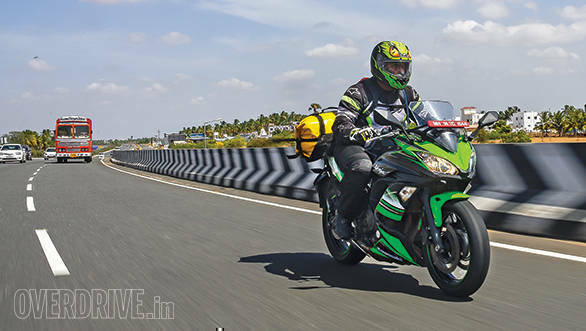 It's the only fairing in this test and no surprise, the Ninja 650 is a star. 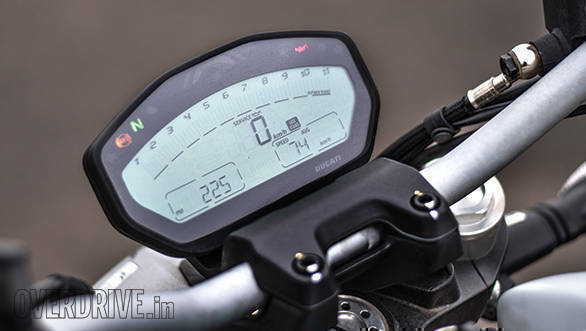 It was, by far, the easiest machine to sit at sustained speeds on and the relatively tall bars, comfortably rearset pegs and the well-designed seat make the Ninja great for hours and hours of mile-munching. Inasmuch, the new Euro-IV engine is also smoother, the chassis more responsive and the ride quality is more plush. It's a very, very good tourer. No matter what the pace the lead rider chose on our 3,500km run, the Ninja 650 ran as if it was the speed that it was designed to run in the first place. You couldn't ask for more, really. The Ninja, further, was also the motorcycle with easy luggage mounting options and once you had it mounted right, it remained a spacious motorcycle for the rider. 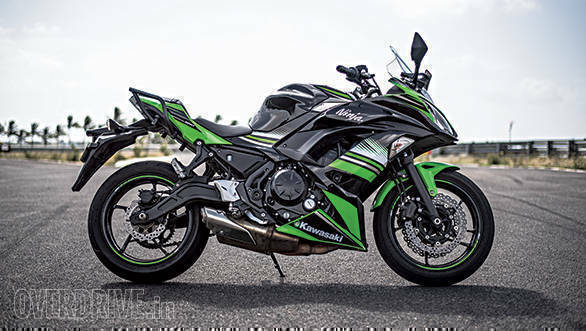 In essence, this is a consummate highway machine and everyone who has ever toured on, say, the Honda CBR250R, will love the Ninja 650 immensely. Oh and lest we forget, Ducati and Harley, look, that's called a fuel gauge - you really should try one. The Kawasaki impresses. Again! It's a smooth, rapid performer with neat and clean manners. The twin thrashes firmly down the straights, you can brake hard - there is a lot of dive though - and then flick the motorcycle onto its side quickly too. Unlike the Ducati, the Ninja 650 steers a bit slower and is more stable mid-corner. You have to go really, really fast before the softer suspension or the tyres get in your way. 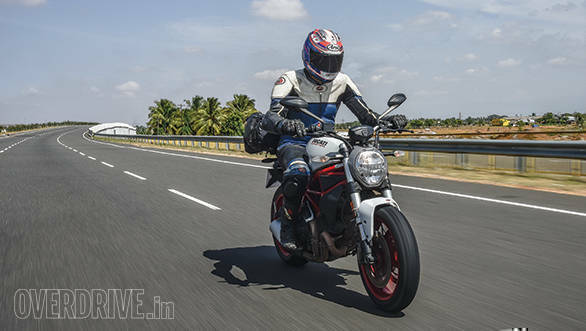 In feel, its nature is genteel, so while it isn't a lot slower than the Ducati, it feels more relaxed on the exits. 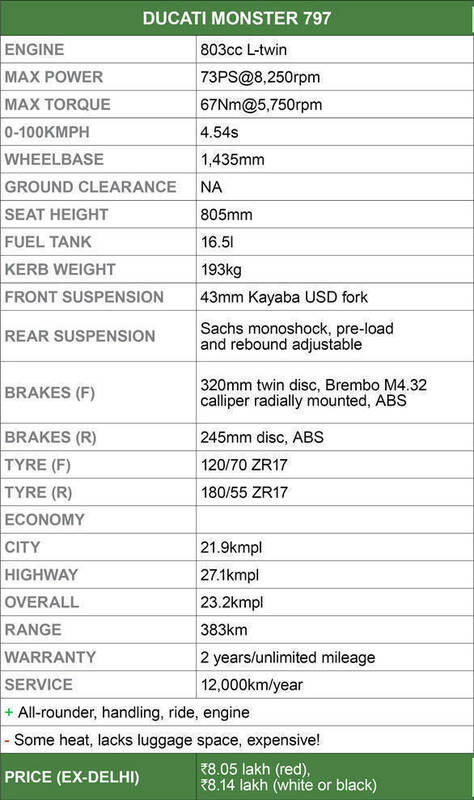 The tyres, surprise, also offer remarkable grip and poise until the pace is really, really high. In some ways, the Ninja 650 doesn't feel all-out sporty. And honestly, it is not meant to be as well. But if you owned one and took it to the racetrack, I think you'd have a good ride. What a versatile motorcycle! We got pretty rapidly to the overall part on the Ninja, eh? Yes, I noticed that too and that's the problem with the Kawasaki. Functionally, the Ninja 650 is ace. It feels natural in the city, stellar on the highway and the new one is a lot more capable at the racetrack than the old one. 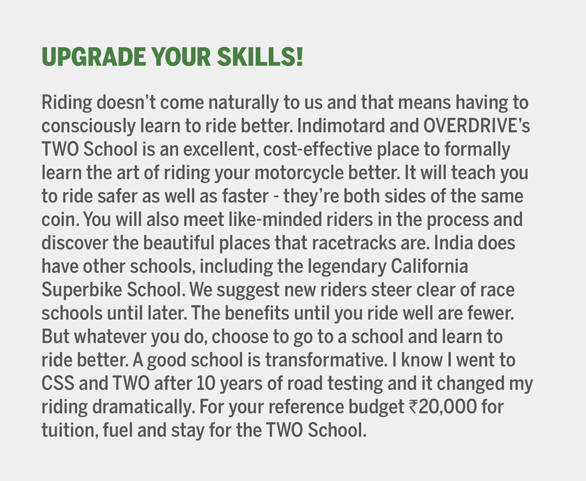 But the Ninja 650 lacks flair. It's a little bland to taste and this shows in the notably lower levels of excitement even as Anand, Rishabh and Akshay appreciated how easy it was to access the Ninja 650's well-developed and considerable performance. What a test! I can honestly say that despite testing hundreds of bikes in the average year and personally owning smaller as well as larger machines, I am pleasantly surprised. Here, ladies and gentlemen, are three machines that should make new riders as happy as a pig in the mud, a puppy in the morning and as a millennial receiving 10,000 likes within moments of posting their latest mood-selfie. The outlier here is the Harley-Davidson, that is without a doubt. The Street Rod was born of a platform that produced a middling cruiser in the Street 750 but the 'Rod is bursting full of life and capability. The Ninja and the Ducati both technically have a better ride quality, but there's no way I can classify the Harley as uncomfortable. And I'm happy to say that it overcomes some of the challenged endemic to the long-low format that it comes from. The Ninja and the Ducati are perhaps a little bit easier to ride over long distances too, but the rider on the Street Rod, over 3,500km, was always within a shout in terms of pace as well as overall exhaustion levels. So highway manners are not a deal breaker either. 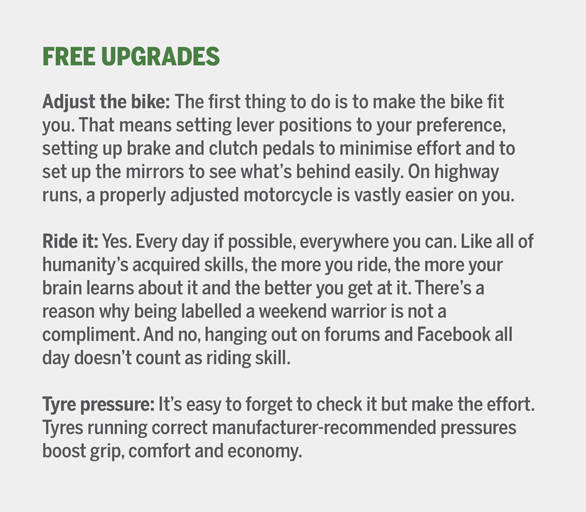 Both the other bikes also get imported tyres but I cannot bring myself to complain about the stock MRFs. And the more you delve into the Harley, the more impressed you become with what the Motor Company has managed to pull off. The Harley unfaithful, if they test ride it, might have to do some dark custom soul-searching. That being said, it cannot win this test. The Ninja is better value at Rs 5.33 lakh and the Ducati does feels more premium at Rs 8.05 lakh (both ex-Delhi). But there's a long list of solid reasons to consider the Street Rod. To us - that's all four riders on this test - the Street Rod is the best sports-cruiser money can buy in India. The sole real negative is that you're going to get tandoori left thigh - I do believe Harley is working on this right now so a future solution of some sort will come. That brings us to the Ducati. This is a seriously improved motorcycle from the 795/6 and a tremendous beginner's premium motorcycle. There is nothing, literally nothing, that the Ducati doesn't do well. It's as sporty as they come, the ride quality is genuinely good, the 73PS engine has been toned down to feel alert and natural rather than jumpy like on the Scrambler...I could go on and on. The issue is price. The Ducati is a full Rs 2 lakh more than the Harley and a further Rs 70,000 higher than the Kawasaki. 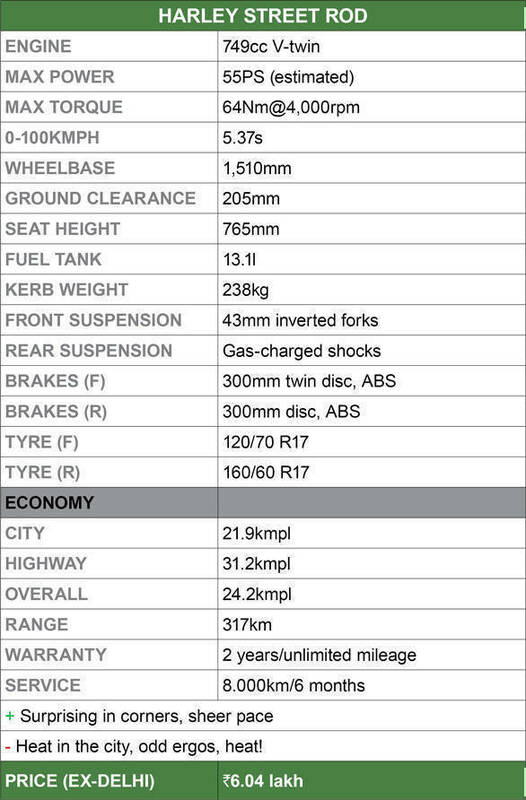 It does have premium tyres as well as brakes, so you aren't just paying for the name tag. The lighter weight and extra performance also make it notably quicker than all of the others. But these are all the secondary reasons to get one. The reason to buy the Ducati is the simplest one of all. 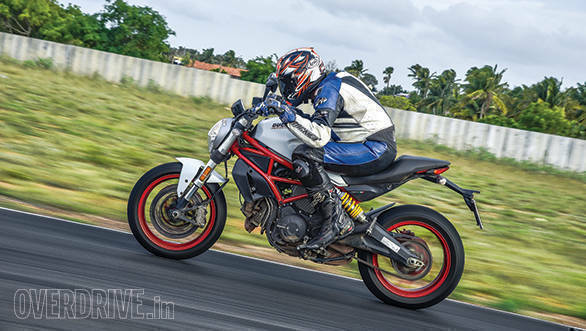 The Ducati Monster 797 feels special to ride, blending the ability to feel friendly and supportive with genuine highway and track capability, and agile, effective city manners. It is the best motorcycle here. This is a terrific all-rounder. If budget isn't the constraint, to be honest, this is the motorcycle that would make the most people happy. But the winner is the Kawasaki Ninja 650 which once again demonstrates how good the Japanese company is at making entry-level bikes. Here's a CKD product that undercuts an Indian-made bike by Rs 70,000. This is without any obvious corner-cutting which is doubly impressive. More to the fore, the Ninja 650 is a serious weapon. We could not find anything to complain about its city behaviour - though the marginally smaller Z650 will probably feel more natural. It's a superb, all-day, all-weather highway motorcycle. 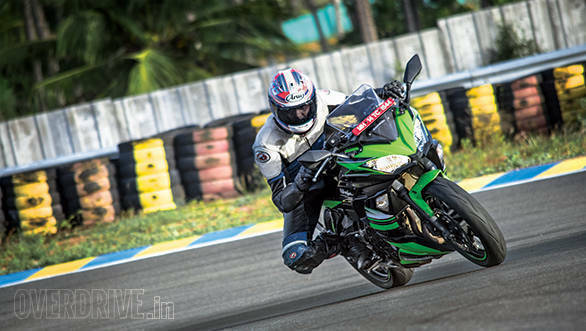 And it managed to handle the racetrack with an enthusiasm and ease that the older Ninja 650 simply cannot match. 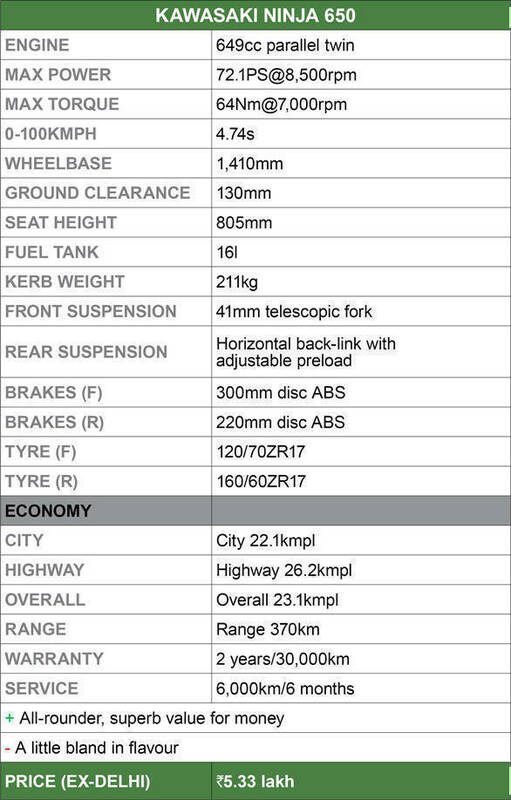 All that and the cheapest bike on test? I think we can safely call that a resounding victory for new riders.